And then also there was this. 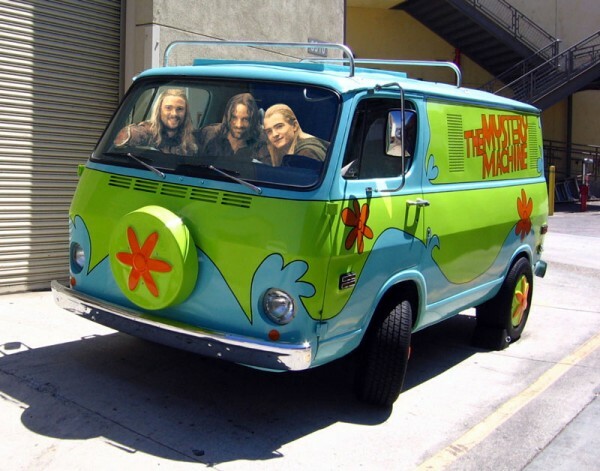 So I read: "Aragorn and Legolas went now with Eomer in the van." And of course automatically I think, "Hehe. Wonder if anyone's photoshopped the image in my head." Yeah. Of course they have. Saruman would've gotten away with it, too, if it hadn't been for those meddling kids. If I had a van I'd be tempted to get that TTT quote made into a bumper sticker for it. But it's not a cool van. Ahahaha...! That just made my morning. Thank you. LOL! This is pretty good, but I like your image better. I want a van like that for the summer! Definitely more useful for summer excursions than for driving into battle against Orcs, I bet. Peace & love to you as well!